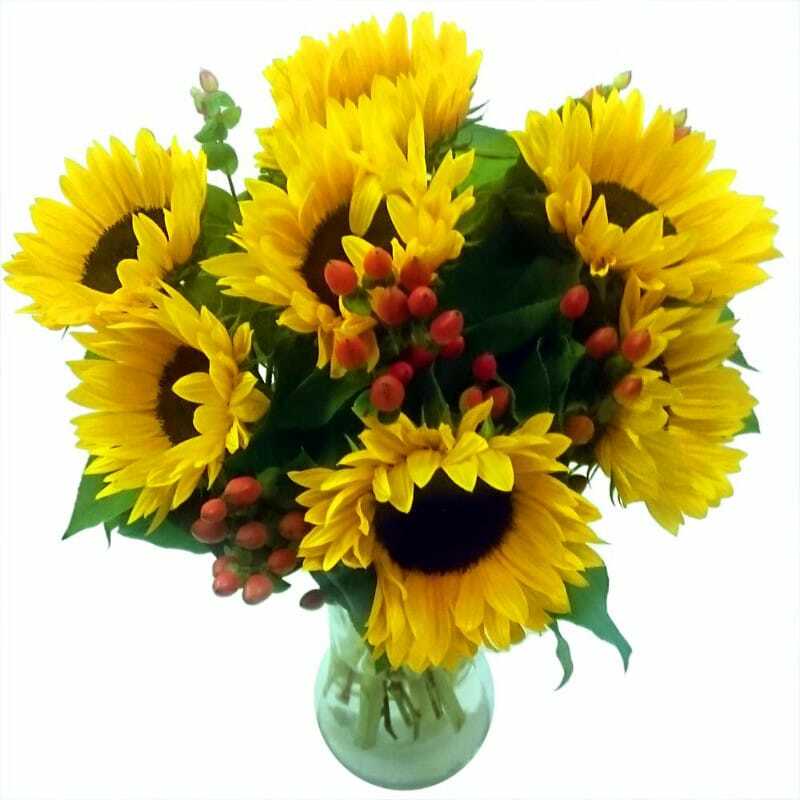 The Sunflower Surprise is a vibrant bouquet packed full of fabulous sunflowers to capture the essence of hot summer days. The broad, golden face of the sunflower, packed with those tiny seeds, has a deep connection to the golden days of summer unmatched by any other flower. Taking this natural sunniness of the Sunflower as our theme, we've constructed an amazing summer bouquet around it – the Sunflower Surprise! So what's the surprise? Well, you're certain to be surprised at just how great this bouquet looks when it arrives! The honest, rustic faces of the sunflowers are set off perfectly by thick sprays of luscious green foliage and delicate red berries. The result is a bouquet that, wherever you place it in your home and however miserable it might be outside, will put a golden glow into the room. This means that the Sunflower Surprise makes a great gift as well – there aren't many ways to give someone you love a gift of sunshine, but this is one! Sunbeams of happiness radiate from this sublime yellow bouquet. Get summer delivered to you all year round! Sunflowers might say summer, but our bouquets are available for flower delivery any time of year. Carefully picked and prepared by our expert florists, the Sunflower Surprise will come arranged with loving care, and carefully hand-tied and packed so that it arrives to you in pristine condition. you can have these flowers delivered 7 days a week throughout the UK, with FREE next day delivery Monday-Friday. You needn't worry about a thing: your flowers will be delivered in our special delivery box to prevent damage while in transit, so they arrive in excellent condition all for just £29.99! For that extra special personal touch, we offer a whole range of options to make the Sunflower Surprise bouquet into a truly unique gift. Why not add a Handwritten Greetings Card, a delicious box of Lily O'Briens Chocolates, a chic glass vase or an adorable teddy to accompany your beautiful fresh hand-tied Sunflower Surprise bouquet? We also have a large selection of flowers in our Flowers under ?35 as well as a many arrangements containing sunflowers, hypericum and an array of different gift sets to suit every occasion.